For those suffering from sciatica, a comfortable sleeping position can be elusive. Sciatica commonly strikes at the most inconvenient times – like when you’re trying to get a much needed rest. If you can’t get enough sleep because of the pain, then the discomfort could get ten times worse each night. It is essential to not ignore the underlying cause of nighttime sciatica so you can find a lasting and effective solution. In today’s post, we’ll discuss the different manifestations of this condition that may be tied to sleeping positions worsened while reclining. When the body is at rest, any pain should be at a minimal. Unfortunately, that’s not the case with sciatica; it usually strikes as soon as you lie in be and try to relax, or it even wakes you up in the middle of the night. These pain syndromes are almost primarily of psychogenic source. Nighttime sciatica is believed to occur due to the following reasons: 1) the heart pumps less blood than normal when you are at rest or sleeping; 2) the body’s horizontal position when sleeping causes a decreased lower body blood circulation and less oxygen going into the legs. This is why doctors recommend people to keep their legs elevated while sleeping or resting. On the other hand, it is possible for you to experience more physical pain due to emotional issues which is heightened when your subconscious take over during sleep. In some instances, there may be structural reasons why pain is intensified when reclining, due to position-based parameters. These can be addressed through physical therapy. Sciatica or any muscle pain is worsened when you can’t find a comfortable sleeping position; it almost feels like a constant battle trying to find any form of relief. Your sleeping position can contribute to knowing what your pain level is and if you are experiencing a flare-up. Keep in mind that pain is different to each person; what works for someone else may not work for you. Nevertheless, here are some suggested sleeping positions for sciatica sufferers. It may be challenging to get into another sleeping habit, especially if you are used to your existing one. However, just keep at it and be patient. When experimenting with these different sleeping positions, other health factors may influence the pain you endure. As you try a new sleeping position, give yourself several nights to try it out; it will eventually be more comfortable over time. 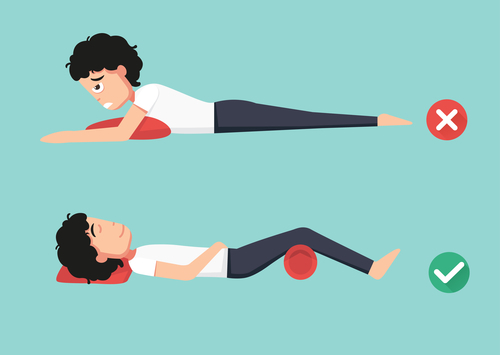 Placing a pillow under your knees can be good for the low back. This position is called “supine position” and helps hold the natural curve of the spine. You can even place a rolled towel under the small of your back. However, if you sleep on your back with no support from pillows, it might contribute to greater pain; this is due to your spine staying in a flexed position. And while sleeping on your back is good for those with back pain, it is not advisable for people who have sleep apnea. Sleeping on your side when you have sciatica will only work if you use one or two pillows between the legs to avoid twisting pressure and add support on the lower back. This will help keep the leg and spine in a comfortable neutral position. Side sleeping is can also help relieve heartburn. This position is actually not a good way to sleep for anyone. It lets your back arch unnaturally and can cause more pain. Sleeping on your stomach causes the back to extend and work against gravity. If you can’t find any other comfortable sleeping position, you can make a slight adjustment by placing a pillow beneath your stomach or under your pelvis. This solution can help your back maintain a neutral position. Avoid caffeine during late afternoon and in the evening. If you’re suffering from sciatica, this tip is particularly essential. The pain is already contributing to sleepless nights, and you don’t need another cause for it. Use an ice pack to help relieve pain on the lower back so you can fall asleep easier. Keep your bedroom the right temperature and darkness to avoid any disturbance or disruption.